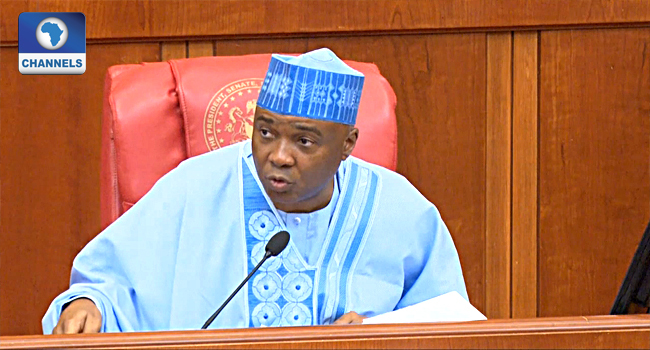 (File) Senate President Bukola Saraki speaks during a plenary at the Senate Chamber of the National Assembly in Abuja. The Peoples Democratic Party (PDP) has accused the All Progressives Congress (APC) and Federal Government of seeking an interim court order to declare vacant, the seat of the President of the Senate, Dr Bukola Saraki. PDP National Publicity Secretary, Mr Kola Ologbondiyan, said in a statement on Friday that the alleged plot was because of the defection of the Senate President from the ruling party to the opposition. “The PDP alerts that credible information at its disposal showed that some cabals in the Presidency and APC had perfected a plan to institute a lawsuit to challenge the validity of Saraki’s seat with the sole aim of securing a fraudulent injunction to force him out of office pending the determination of the substantive suit,” Ologbondiyan claimed. The PDP spokesperson, however, said his party was confident that the Chief Justice of Nigeria would protect the sanctity of the judiciary, especially at this time in the country’s history. He called on the institution of the judiciary at all levels to immune itself from being used by those he called “enemies of our democracy”, saying no house falls leaving its roof standing. “The PDP holds that this newest devilish plot to destabilise our democracy lays credence to our earlier stand that President Buhari’s supposed London vacation is a ploy to absolve himself of responsibility for the political terror they have plotted to unleash on the opposition, especially the National Assembly,” he alleged. Although the Presidency has since denied the allegations, the PDP called on Nigerians and the international community to be on the alert. The Senior Special Assistant to the President on Media and Publicity, Mr Garba Shehu, had told the opposition party that Nigerians no longer believe them. “Claims by the failing Peoples Democratic Party that President Muhammadu Buhari had taken a 10-day leave in order to leave the stage for illegal and unconstitutional actions by the administration are both ridiculous and a hollow narrative to garner cheap sympathy,” he said in a statement on Thursday. Shehu added, “That the President, himself a sworn democrat had handed power to his deputy without compulsion is itself exemplary and innovative, something that the PDP failed to produce in their sixteen years of monumental mismanagement and sadistic plunder. “For the benefit of the doubters, Professor Yemi Osinbajo, SAN, the Vice President who acts in the absence of the President, is a lawyer of the highest rank and a social rights crusader who had received local and international acclaim before he took the present office. It is inconceivable that this is the team to copy the bad manners cast in stone in the PDP.